Preheat oven to 325 degrees. Melt butter, browning lightly. Pour into mixing bowl, and cool. Bea tin sugar and stir in flavorings. Add flour and baking powder; mix well. Chill dough for a short time, then shape dough into small balls, about 1 teaspoonful each. Top each with a pecan or almond half. Bake on ungreased cookie sheet 15 to 290 minutes. Makes 50 cookies. 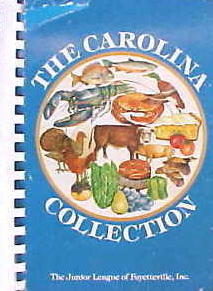 More "Lost" Recipes from "The Carolina Collection"